Katherine Nicholson Marenco (’03) and I did delightful fieldwork on the Isle of Portland in Dorset, England, during the summer of 2002. 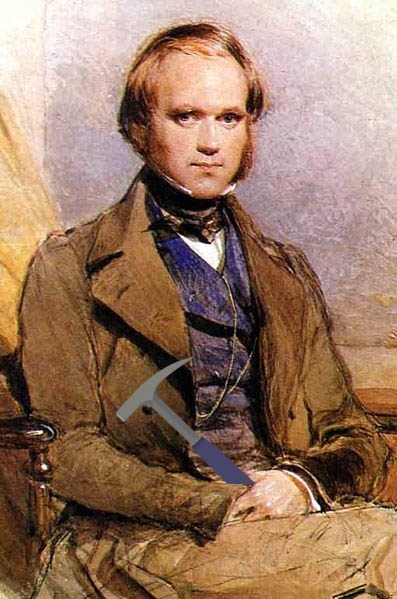 We collected fossils from the famous Portland Limestone (Upper Jurassic) in a series of working quarries. 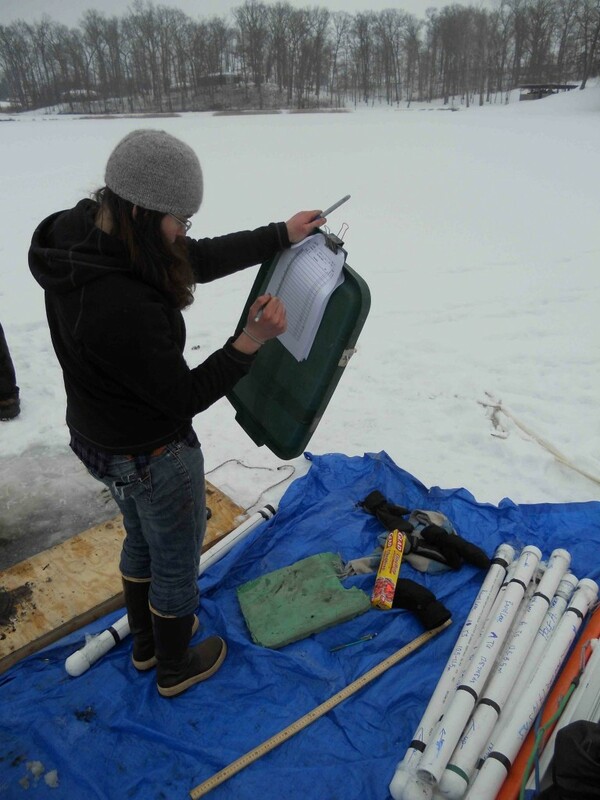 Katherine completed her Independent Study thesis on the topic (“Paleoecology of a cryptic shell-encrusting community: observations from ‘upside-down’ encrusters in internal molds (Upper Jurassic of southern England)”) and the next fall gave her first GSA talk about her findings. 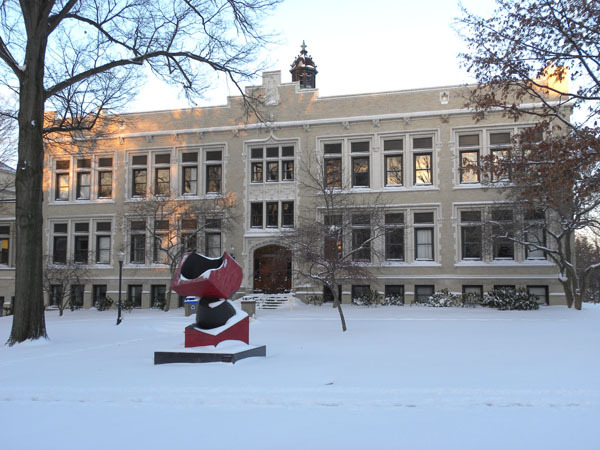 Now Katherine is a paleontologist at Bryn Mawr College. 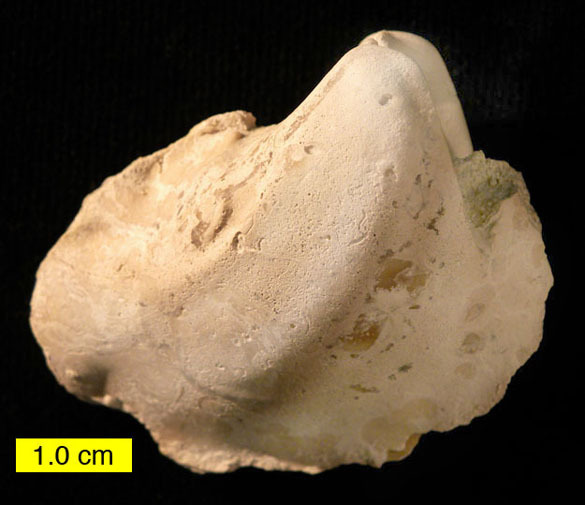 One of the common fossils in the Portland Limestone is the trigonid bivalve Laevitrigonia gibbosa (J. Sowerby, 1819) pictured above. It is usually preserved as an internal mold, meaning that the aragonitic shell dissolved away, leaving the sediment fill. The Dorset quarrymen thought these fossils resembled horses’ heads (in their dialect this comes out as “‘osses ‘eds”) and the name stuck among collectors. If you hold the internal mold upside down, there is a vague resemblance. Trigonid bivalve in an outcrop of the Portland Limestone. It is "butterflied" meaning that the valves were still attached to each other by the ligament. Our scientific fascination with this fossil went beyond its preservation and paleobiology (it was a mobile infaunal suspension feeder). After the clam died and the soft parts rotted away, a variety of organisms settled on the inside of its shell. These sclerobionts are preserved upside-down on the internal mold. Close-ups of the outside of the L. gibbosa internal mold showing "upside-down encrusters": an encrusting oyster Liostrea expansa (o), a colony of the cyclostome bryozoan Hyporosopora portlandica (b), and a serpulid worm (s). 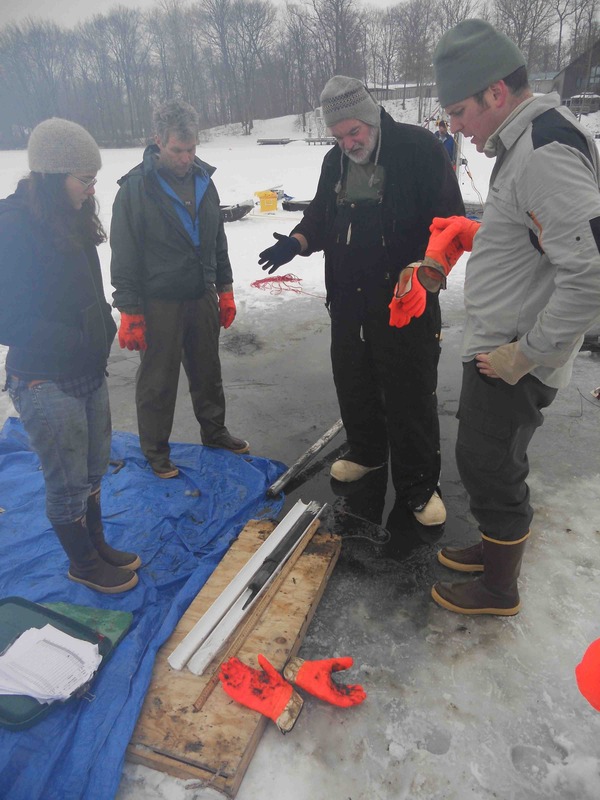 Katherine was able to sort out the identity of these encrusters (not an easy task from the bottom! ), their succession and their growth and development. 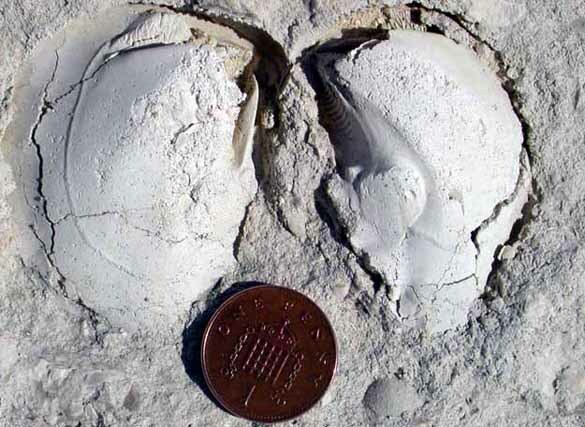 Entire communities lived in these half-closed shells lying on a shallow seafloor 150 million years ago. An ordinary ‘osses ‘ed yields extraordinary paleontological detail. 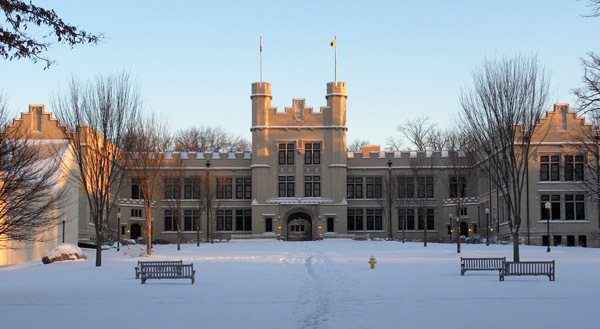 Scovel Hall, The College of Wooster. 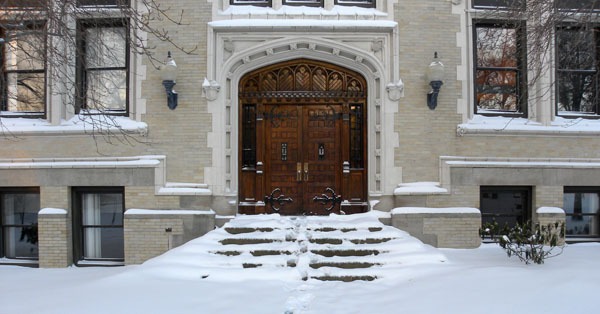 Front doors of Scovel Hall. Polygons are common in nature, whether in two dimensions as desiccation cracks or in three dimensions as with columnar basalt. They result from “closely-packed” disks or tubes. 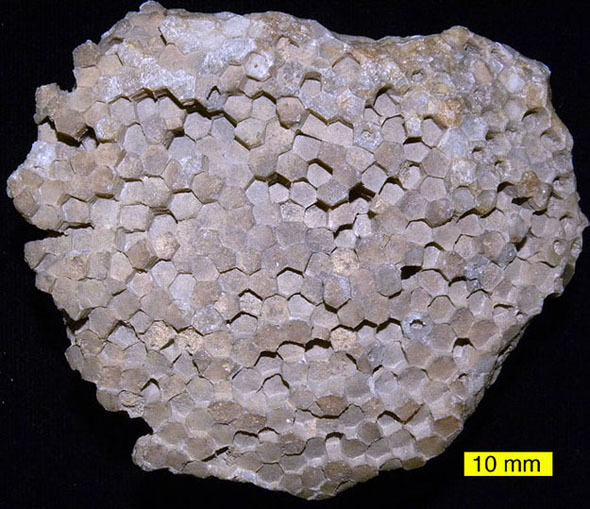 The honeycomb coral (Favosites Lamarck 1816) is one of the best fossil examples of hexagonal packing. As you can see in the drawings above, the corallites are distinguished by internal horizontal partitions called tabulae and holes in the walls termed mural pores. 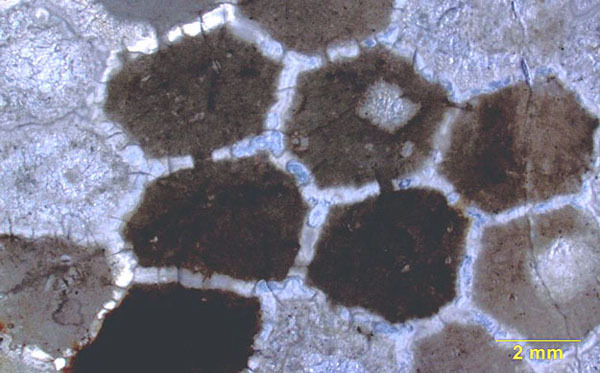 These pores most likely allowed internal soft tissue connections between the polyps so that they could share digested nutrients. Thin-section of Favosites from the Upper Ordovician of southern Indiana. Note the gaps in some corallite walls. These are mural pores. Favosites as a genus has a very long history. 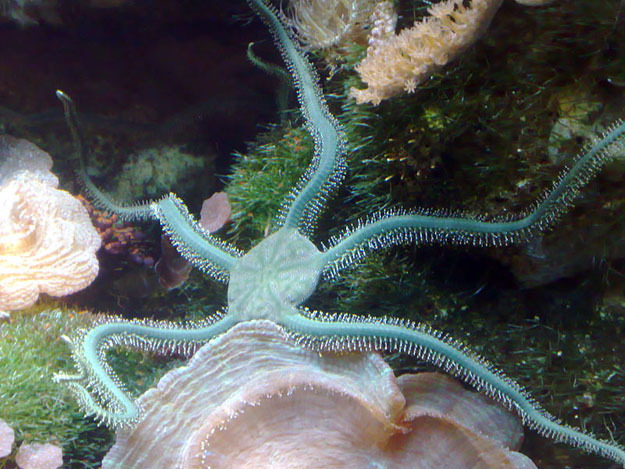 It was named by the famous French natural historian and war hero Jean-Baptiste Lamarck. It is a favorite in paleontology courses because it is so easily recognized. 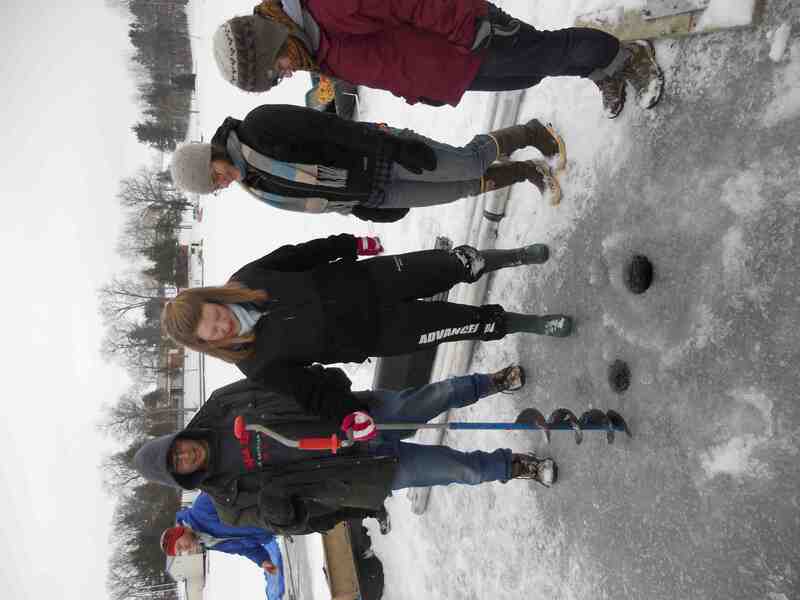 Meteorites Observed on the College of Wooster Campus! 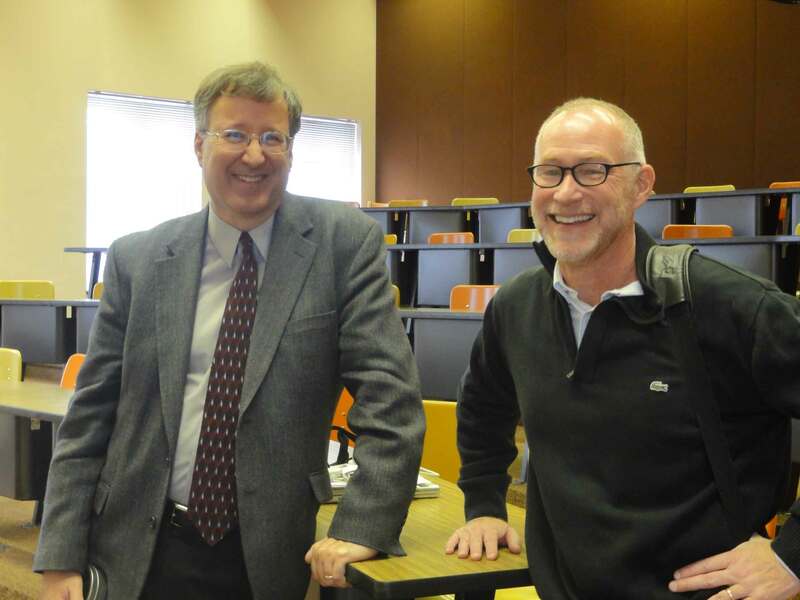 Dr. Ed Young ('81, on the right) with his favorite TA and fellow Wooster alum, Dr. Mark Wilson (left). 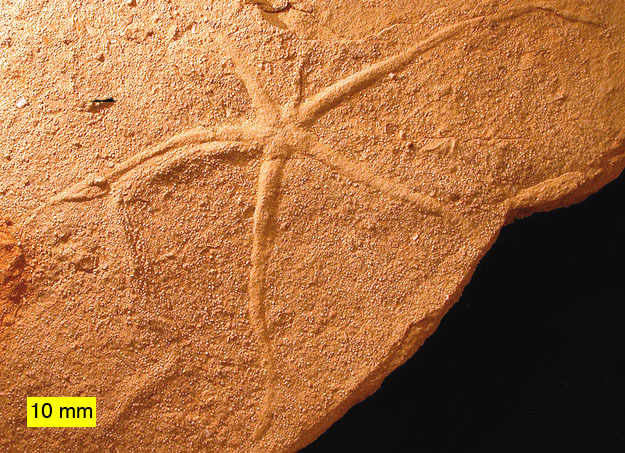 This week’s fossil is a departure from our usual set of marine invertebrate animals. Above is a leaf of Viburnum lesquereuxii from the Dakota Formation of Ellsworth County, Kansas. The rocks enclosing it are from the Upper Cretaceous Cenomanian Stage, roughly 93-99 million years old. 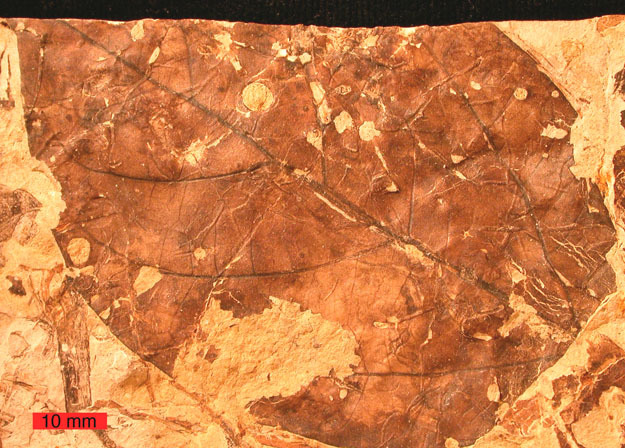 The leaf is preserved as a carbonized film in excellent detail. What is cool about this particular leaf is that it has damage from insects that fed on the softer tissues between the veins. These feeding trace fossils are distinguished by smooth edges around the circular holes where the plant grew to seal off the torn cells. The leaf-eating insects may have been beetles or some kind of caterpillars. 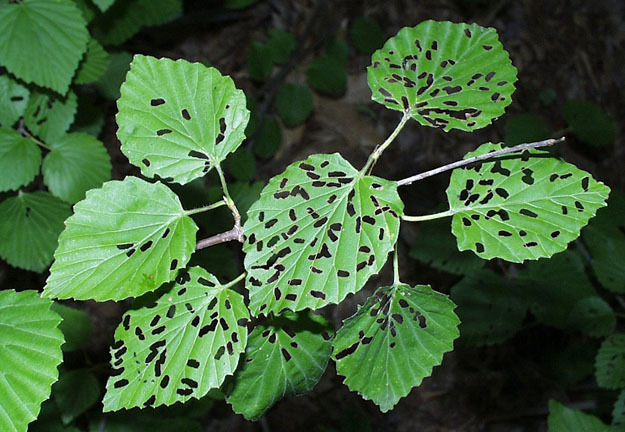 Viburnum is a common and diverse group of plants today, and they still experience significant insect herbivory, as shown below. Beetles chewing holes in a modern Viburnum (http://www.maine.gov/agriculture/pesticides/gotpests/bugs/vib-leaf-beetle.htm). Viburnum is a flowering plant, an angiosperm. This group appeared in the earliest Cretaceous (about 140 million years ago) and started a rapid rise to dominance just about the time this fossil leaf and its insect pests were alive. This little ecological vignette gives us an insight into the early days of our modern flora. 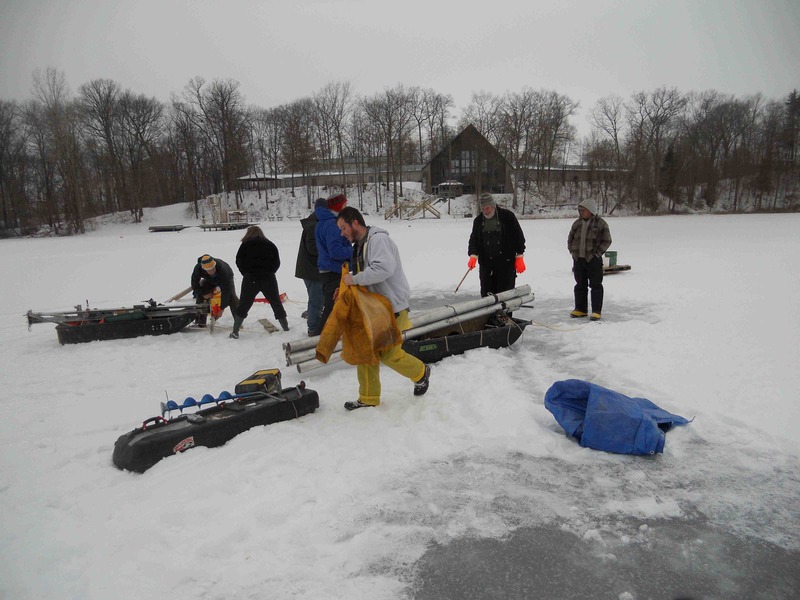 A group from the Wooster community, the University of Cincinnati, The College of Wooster and St. Lawrence University assembled in Wooster for the weekend to mount an expedition to recover many meters of lake mud from the bottom of Round and Long Lakes in Ashland County, Ohio. Dr. Lowell goes over the theory. 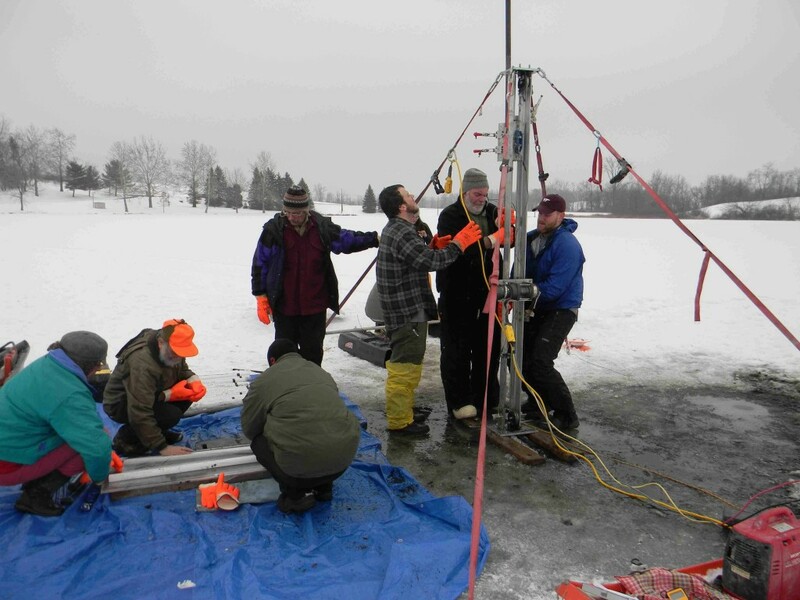 The practice consists of extracting meters of mud from the lake bottom. 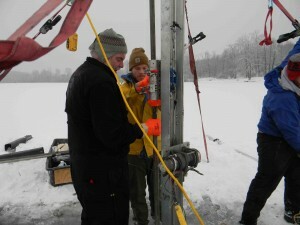 Steph takes the vital notes on each meter (left). 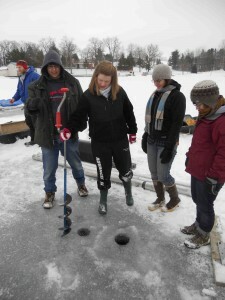 Lindsey (right) steps up to core another hole in the 6 inch-thick ice. After a day coring Round Lake the team moved onto Long Lake and targeted the upper several meters of sediment to be analyzed by Jon Theisen for his senior IS in Archaeology. 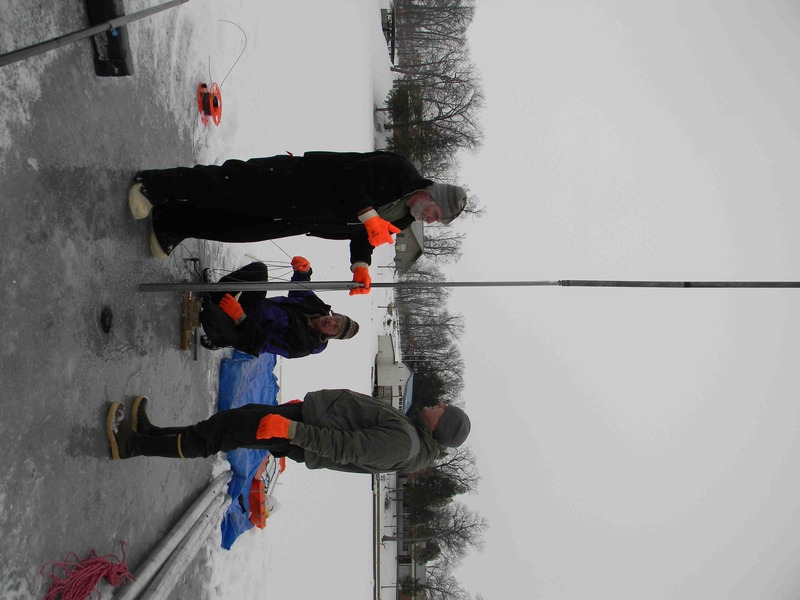 Jon hopes to shed some light on the environmental changes that occurred approximately 1500 years ago during the end of the Hopewell era in Ohio. … we should record this morning’s ice storm in Wooster. 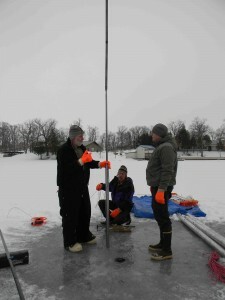 You can read about the surprising properties of water ice as well on Wikipedia. 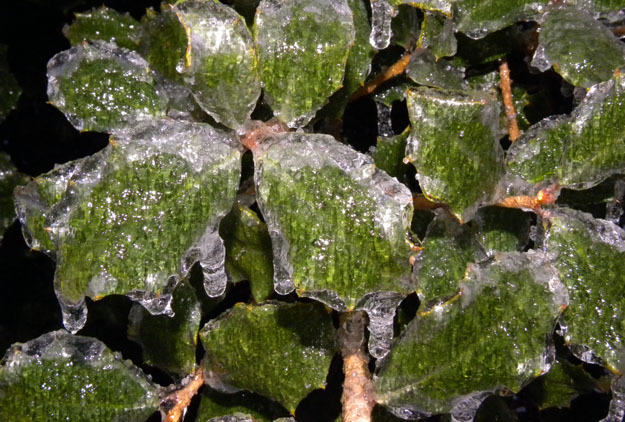 Ice on the holly tree near the back door of Scovel Hall in Wooster, Ohio. 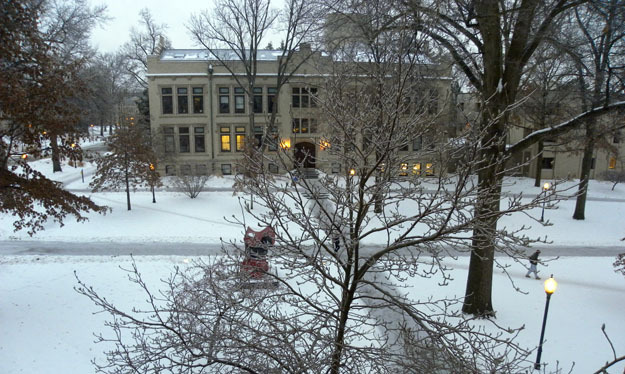 The view from Scovel Hall across the College Mall to Severance Chemistry. This makes me long for hot desert days.